JOE JACKSON JR: Thanks Raff! Joe Jackson jr., the great clown cyclist, son of the legendary vaudeville headliner here performing at Stockolm circus building for the Swedish TV show "Clowns" in 1978. NEW CLOWNALLEY.NET DVD NOW AVAILABLE! For awhile now people have been asking me when a DVD of some of the video clips featured here on clownalley.net will be available on DVD. Well, the long wait is finally over. For a limited time only (until the end of this weekend actually) there are 10 copies of our brand new DVD available on eBay and they can be purchased with PayPal. Please click the title of this post to be taken to the auction. I celebrated clownalley.net's 2nd anniversary in complete clown nerdgasm yesterday as I spent the evening having dinner with my friend David Carlyon. 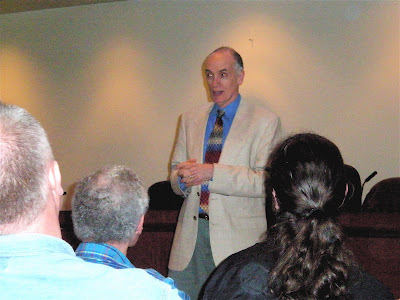 We then made our way down to the Long Branch, NJ Municipal Building (almost next door to Shane's school) where the Long Branch Historical Society had invited Dave to speak on the subject of Dan Rice and his book Dan Rice: The Most Famous Man You've Never Heard Of. Thanks for a great time, Dave! 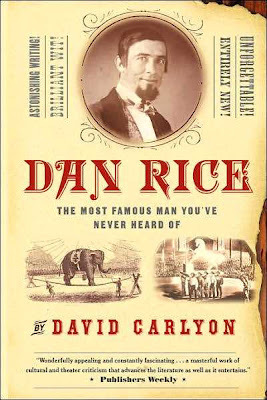 If you haven't read the book yet I HIGHLY recommend it and suggest that you click the title of this post to be taken to the Amazon.com listing for the hardcover edition. 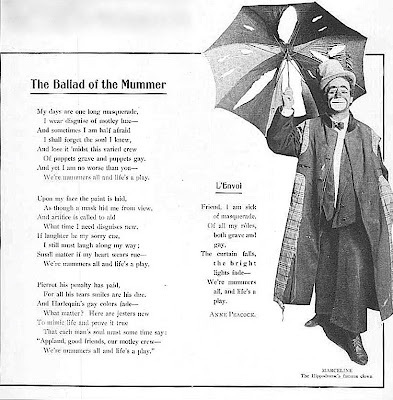 A page from the 1907 program from the New York Hippodrome featuring a photo of Marceline Orbes accompanying a poem by Anne Peacock. My favorite moment in the film comes, courtesy of Spike Milligan, at about 6 minutes and 30 seconds in. The Running Jumping & Standing Still Film is a short (eleven minute) film directed by Richard Lester and Peter Sellers, and starring Spike Milligan. The film was released in 1960. It was a strong influence on Lester's later film, A Hard Day's Night, starring The Beatles. Lester also directed the Beatles in Help! and John Lennon in How I Won the War. Some of the ideas here were better articulated in Lester's 1969 film The Bed-Sitting Room. The Running, Jumping, Standing Still Film was shot over two Sundays in 1959, at a cost of under fifty pounds - including five pounds for the rental of a field. It was nominated for an Academy Award, but did not win. It is available on some copies of the DVD version of A Hard Day's Night, and it featured in The Unknown Peter Sellers. Today marks the beginning of clownalley.net's third year online. 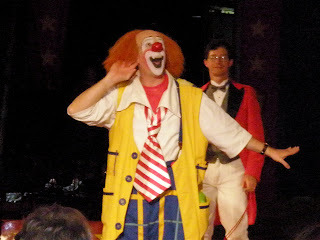 When I launched the site in 2006, I had two goals: I wanted to honor the great performers of the past by posting some of the photos and video that I had been collecting since childhood; and I wanted to clear up much of the well-intentioned misinformation concerning circus clowning that had sprung up online. 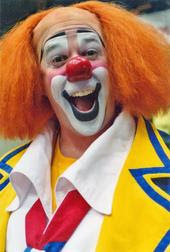 Clownalley.net wasn’t the first website devoted to circus clowning, but almost from the day it went online, it became the most viewed with some of the best research and first-hand information available online – and it still is, thanks to it's many regular contributors. 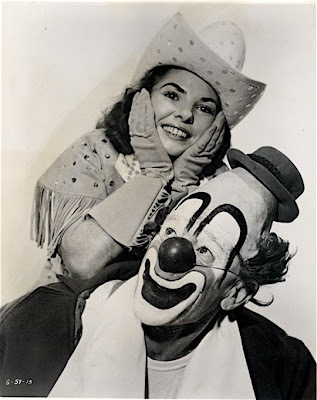 I knew a well-researched circus clowning blog might be interesting and useful to others, but I had no idea how quickly it would be embraced and enhanced by other current and past performers and fans. This site is now viewed around the clock by people worldwide. I thank you all for clownalley.net's continued success and look forward to celebrating many more milestones with you in the years to come. Today also marks another, very sad anniversary; the passing of Warren "Red" Ryder Schwartz in Austin, TX on May 28, 2006. Please click the title of this post to read a memorial by Robert Faires from the Austin Chronicle. Lou Jacobs and the beautiful Ms. Sally Marlowe in 1959. Photos from this session would be used as the basis for the 1962 Ringling program cover. 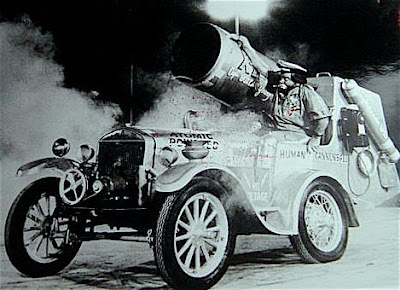 Rex "Count de Boxcar" Young and his Cannon Car. DREW RICHARDSON:Help! Help! I Know This Title is Long, But Somebody's Trying to Kill Me! The opening scene of Drew "Drew the Dramatic Fool" Richardson's solo visual comedy theater show directed by Avner "The Eccentric" Eisenberg. Bill Irwin (who is currently at the Philadelphia Theater Co. premiering his Happiness Lecture through June 15th) performs with Martin Short for Steve Martin, Martin Scorsese and possibly other, less talented people, with "Martin" in their names at the Kennedy Center Honors Steve Martin in 2007. For those who missed it, here are Jimmy and Brenda Graham along with their triplets Holly, Candy and Millie Graham, from a recent episode of MTV's "reality" series True Lives. My uncle, Robert Richardson attended the Ringling School of Art in the early fifties. While there, he was also an extra in The Greatest Show on Earth. 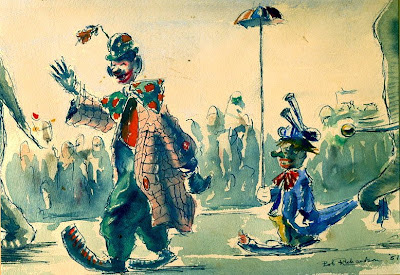 This is one of his clown paintings he did in 1951. I don't know if they are specific clowns he saw, or just impressions he had. He died two years ago, May 20th, at age 78. I inherited this painting. He had others but my family doesn't know what happened to them. 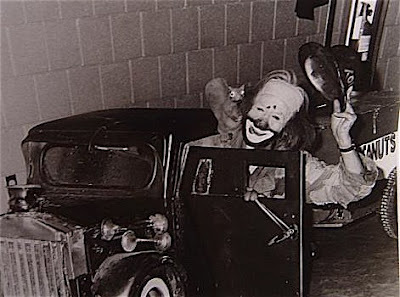 Because this had always been on his wall, I realized these were the first images of clowns I ever saw in my life.